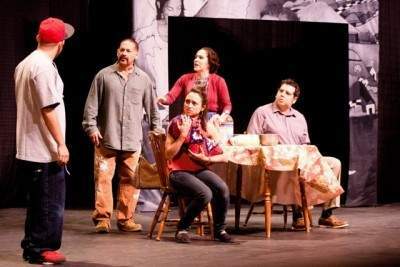 The celebrated play will make its Orange County debut on Thursday-Saturday February 11-13, 2016 brought by playwright Paul S. Flores, Santa Ana Building Healthy Communities (SABHC), and Breath of Fire Latina Theater Ensemble. Performances take place at South Coast Repertory in Costa Mesa. The play explores many themes including: gangs, incarceration, police conduct, family restoration, and post prison re-entry. PLACAS sparks a conversation about the need to understand the realities and obstacles of affected youth and families. Tickets will be complimentary for Santa Ana residents and UCI students. 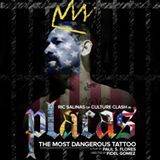 Directed by the Latino Theater Company’s Fidel Gomez, PLACAS (barrio slang for body tattoos) stars Ric Salinas, a founding member of the critically acclaimed performance group CULTURE CLASH, as Fausto “Placas” Carbajal, a Salvadoran immigrant who tries to reclaim his family while letting go of his gangbanger past. PLACAS is written by acclaimed spoken word artist Paul S. Flores. Flores interviewed more than 100 gang members, parents and intervention workers in the Bay Area, Los Angeles and El Salvador to develop material for the script. 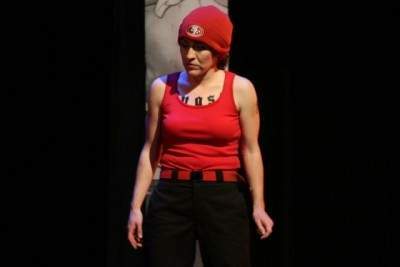 Salinas’ role of Fausto is loosely based on the experiences of ex-gang member Alex Sanchez, founder of the Los Angeles based violence prevention non-profit Homies Unidos. This is a limited engagement. Other actors in the cast include Ricardo Salinas, Zilah Mendoza, Xavi Moreno, Sarita Ocón, Eric Aviles, Emiliano Torres and Edgar Barboza. The performances will start at 7:30 p.m. at 655 Town Center Drive, in Costa Mesa. Event parking in structures is $10 cash only. The parking structure is not owned or operated by South Coast Repertory. Click here for $10 BrownPaperTickets. Free for all Santa Ana residents and UCI Students. Reserve free tickets here. Recommended for ages 12 and up. A very special THANK YOU to South Coast Repertory (SCR) for providing The Nicholas Studio to host the PLACAS production! Santa Ana Building Healthy Communities (SABHC) is committed to addressing health inequities and improving opportunities to create a healthy, thriving Santa Ana. SABHC understands that health is directly shaped by the circumstances in which people are born, raised, live, and work. Improving these circumstances is a collective responsibility and one that must be led by those directly affected. In street culture, placas signify an individual member’s unswerving loyalty to the gang and also serve as a mechanism to create a new identity. Using Fausto’s tattoos as a metaphor, PLACAS explores the process of tattoo removal as one possible path for former gang members to move forward. Laser tattoo removal is a complicated and painful procedure that can take years to conclude, and it is especially risky for ex-gang members because their former comrades see it as betrayal and may target those who seek treatment. Partly because of this risk, gang prevention workers, police, probation officers, judges and caseworkers see tattoo removal as a legitimate step gang member can take toward reintegrating into civil society. PLACAS was first produced at the San Francisco International Arts Festival in 2012, and has since traveled to over a dozen cities including Los Angeles, Washington DC and New York. Co-commissioned by four nationally respected Latino arts organizations (MACLA, Su Teatro, Pregones Theatre Company and GALA Hispanic Theatre) through the National Performance Network, PLACAS was developed with the Central American Resource Center (CARECEN) as a pro-active community response to the issue of transnational gang violence, presenting positive elements of Central American culture in the context of a hostile, anti-immigrant political environment. PLACAS 2016 California tour is sponsored by The California Endowment Center for Healthy Communities, The National Compadres Network. This project was made possible in part by the Doris Duke Performing Artist Awards program. « Sorry Santa Ana and L.A., the Chargers are staying in San Diego!